Storyboarding is and art, no matter if it's for video, cinema, comic books or other visual sequentials. If you're writing and producing TV spots, educational films, or other promotional motion pictures then Storyboard Artist is an essential! 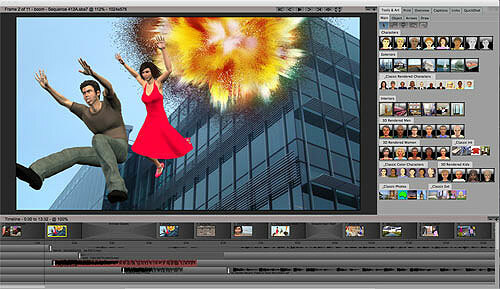 PowerProduction Software is the developer of visualization solutions for film and video production. Their new StoryBoard Artist Version 7 could become the essential digital and animatic storyboard creation tool for filmmakers. The new version 7 release amps up 3D capabilities, adding an unlimited number of character poses, advanced motion graphics, and integration with StoryBoard mobile apps for previs creation across devices. StoryBoard Artist Version 7 gives you the simplicity and speed of working in 2D environments with all the flexibility you want when creating a 3D representation of your vision. It's really the best of both worlds ... Artist 7 eliminates the time and learning curve that comes with creating an entire 3D world. With all the assets at your fingertips, users can quickly and easily create the shot they want. They can tweak characters in 3D just as if they were directing actors. Artist 7 is our best upgrade ever, building on our rich history of innovation in media production software. StoryBoard Artist Version 7 is immediately available through the PowerProduction Software worldwide reseller channel and direct from the PowerProduction Software website for 499.99 (USD). StoryBoard Artist owners can upgrade to the new version 7.0 for 199.00 (USD). Members of the media are invited to review StoryBoard Artist v7. For more information, please email Mariah Stein. Los Gatos, California - PowerProduction Software has been a trendsetter in storyboard software for over a decade. The Hollywood production community has made them a staple in a very competitive niche. Their staff of well-rounded media professionals is dedicated to making sure that the software programming serves the needs of filmmakers. For more information, visit PowerProduction Software online. All Material and Software (C) Copyright 2016 PowerProduction Software. All Rights Reserved. Apple, the Apple logo, Mac OS X and Macintosh are registered trademarks of Apple Inc. in the U.S. and/or other countries. Other trademarks and registered trademarks may be the property of their respective owners.